The Aylesbury Estate story is steeped in history. The Estate is named after the town of Aylesbury from which the Gibbs family hailed. The Gibbs family moved to the Ferguson Valley in 1883, over 140 years ago. The 22 acre vineyard is a part of a family owned farm that has been passed down through five generations. The focus is managing the land to preserve the clean soil and water, in turn growing healthy vines and fruit. James Dagley Gibbs and family immigrated to Australia aboard the ship “Trusty” on 22nd May 1844 from Aylesbury, in Buckinghamshire, England. James married Charlotte Narrowly in 1845 and they had 7 children. The youngest of these children, Samuel, was 2 years old when his mother died, and was placed in his elder sister’s care (Emma) at Ferguson. Aged about 20, Samuel took up the property adjoining his sister and her husband in November 1883. Here he set about clearing the virgin forest on the land by ringbarking with an axe, grubbing suckers and burning logs pulled together by horse. Clearing a small amount of land allowed a house to be built and also the sustenance of enough livestock, vegetables and fruit for the family to exist as pioneers of the district. The eldest of Samuel and his wife Lavinia’s children was Herbert Cleveland Gibbs. Herbert carried on clearing land and farming cattle and sheep on a small scale as well as growing apples for the Perth market from 1923 until 1947. Herbert married Mary Flynn in 1915 and they had 4 children. Howard Basil (“Nug”) Gibbs (third child of Herbert) further developed and expanded the farm into livestock production by clearing land and establishing pastures during the 1940’s – 1970’s. Dairy and beef production flourished and Howard’s innovative nature put him at the forefront of modern technology. 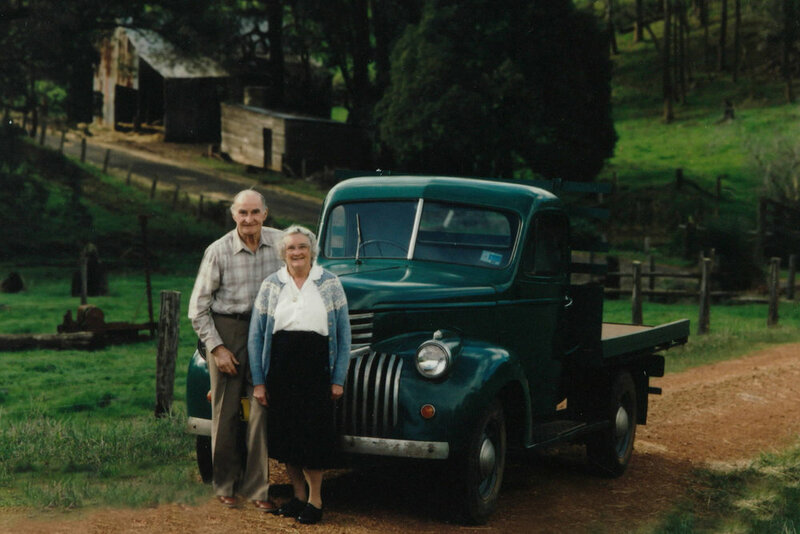 Many of the farming practices we now take for granted were successfully trialled on the Gibbs farm at this time. Howard married Dorrie Gladys McSwain in 1947 and they had 3 children. Gregory Charles Gibbs (youngest child of Howard and Dorrie) continued the beef operation from 1978 and diversified into wine-grapes in 1998. Fruit from these vines has been sold to various wine companies for their production since 2001. Greg and Lyndie have 3 children, including Ryan. The Ferguson Valley climate is similar to south-west Europe and the Mediterranean, with cool wet winters and warm dry summers, perfect for grape-growing. The west coast of Australia is subject to prevailing sea-breezes and the influence of reliable rainfall from winter cold front weather systems. This is somewhat similar to the west coast of France and particularly the Bordeaux region. For this reason we chose to plant Bordeaux varieties and we believe they thrive in our conditions. The property is 200 hectares (500 acres) in total with approximately 9 hectares (22 acres) under vine. The elevation of 160 to 220 meters above sea level enables the cooling sea breezes to reach the vineyard from the Indian Ocean. North-facing slopes were chosen as the best sites for Cabernet Sauvignon, Merlot and Sauvignon Blanc. The soil types of the property are fertile rich chocolate loam with underlying clay, helping to retain moisture for the vines. The native Australian forests surrounding the property provide pure, clean water for our vines throughout summer. Samuel and Lavinia, leaning against the shed which still stands at the Aylesbury farm today. This is the full family, photographed with Samuel and Lavinia (centre) on their 50th wedding anniversary. This photo also includes My Grandfather (Howard) and Great Grandfather (Herbert Cleveland Gibbs) as well as Samuel who was my Great-Great Grandfather. These are Ryan’s grandparents, Howard Basil Gibbs (affectionately known as “Nug”), and Dorrie Gibbs. Pictured on the family farm where the Aylesbury wines are grown. This photo was taken roughly in 1995.